I’ll never forget this wonderful green bean and tomato stew I enjoyed on a number of occasions while visiting beautiful Greece. These green beans served at room temperature alongside a nice brick of creamy feta fast became my favorite Greek comfort food. After several attempts to recreate these succulent tender beans I have finally captured all the flavors, tender consistency and comfort I remember in this stew. My esteemed possession from my visit to the island of Siphnos is a tiny paperback cookbook titled The Best Greek Dishes authored by Mdm. Margaret Phoca. I have referred to this little gem of a cookbook over and over again and have turned out a flawless (in my opinion) spanakópita, braised lamb and stewed potatoes, to name a few. Finally after many failed attempts to cook the perfect green bean stew at home I referred to this tiny cookbook and after making a few minor adjustments I have perfected a delicious bowl of fasolákia fréska. A simple one pot meal. Normally we eat green beans steamed just enough for them to turn a stunning green and yet still a little crisp. After a quick steam bath we toss them in olive oil and salt and savor every single one of them. 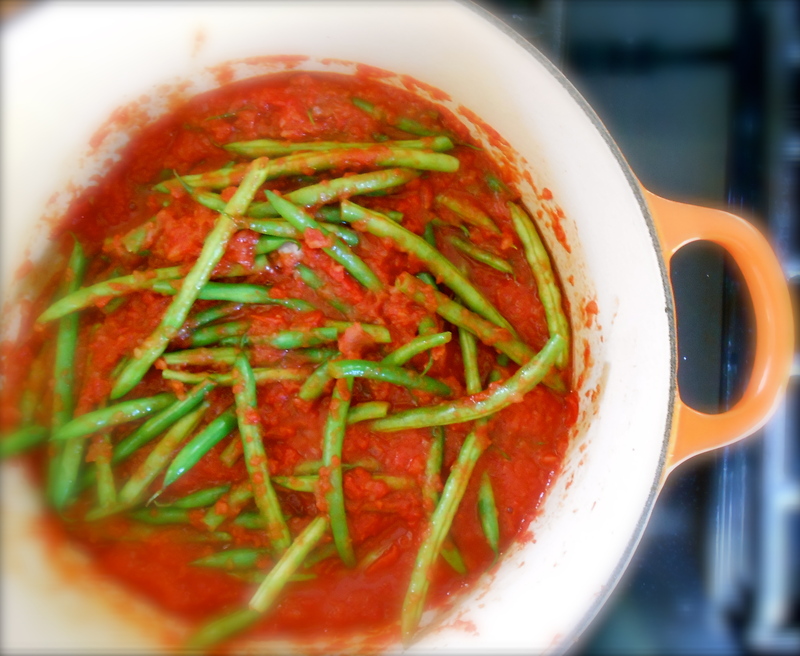 However, green beans are delightful after stewing in a flavorful tomato sauce for an hour or so. They become meltingly tender, sweet, silky and stew like. Although my tiny recipe book recommends serving these cold, these beans are best if left in the pot overnight in the refrigerator and brought to room temperature before serving. Heat the olive oil in a heavy bottomed pot and sauté the onion with a pinch of salt until it is soft and transparent. Add the beans to the pot and stir well until each bean is coated well with the onion and oil. Continue cooking and tossing for a few minutes. Add the chopped tomatoes, stir well and cover for a few minutes to allow them to steam a little. After a couple of minutes uncover the pan and stir, the tomatoes should be thickening at this point. Cover and steam a few more minutes while the tomatoes reduce a little. Once the tomatoes are nice and thick (stew consistency) uncover the pan and simmer, uncovered for one hour stirring occasionally. Taste for salt and season to your liking. Allow to sit for a couple of hours and brought to room temperature before serving. Top each serving with basil, dill and crumbled feta. First to “like” today! What an amazing stew this is! I think I like it already, even before tasting it! Hope your week starts off well my dear! Oh this is wonderful! And I just ordered green beans AND tomatoes from a local farmer, I should get them on Wednesday! Darya…you must use them and make this! What a nice treat to get green beans and tomatoes from a farmer. The feta and herbs are so wonderful on these beans. I even clipped a few of the flowers from the dill and used them. Love it! So I did make this stew for dinner tonight, and it was fabulous! I had some other similar recipes but none that called for topping the dish with dill, basil, and feta, and I did, and absolutely loved it! My boyfriend had it without the feta and loved it too. Definitely keeping this recipe for the future! I am so happy you both enjoyed it! And I really feel like you are a true “test” for criticism. I went to the market today with a very specific list and while in the produce area I approached the green beans and bagged up a bunch of them knowing I need to make them again. And they were not even on my list! :) Thank you for for your feedback Darya. This is so fresh and so Greek. I love that little drawing next to the gorgeous finished product! Thanks for sharing. Oh wow I can imagine how good this is. I can’t wait to try it. What a beautiful drawing! I love it. He’s really talented. I love the style. You should feature them more often! This looks like something I would love to eat! This reminds me of the Italian green bean stew (minus the feta) that my mother used to make. Green beans and tomato sauce just seem to go together. They really do go together don’t they? I will look into the Italian version and see if I can find something. I am very interested! What a beautiful dish.. I will definitely make this dish as my little gardens bounty is overflowing with beans, tomatoes and dill right now… When I was in Greece about a zillion years ago now we had ‘bream’… I think anyway…similar but a mixture of veg with olive oil, it was so good! Your stew reminds me of that. Yum!! I know! It has taken me years to get this one down. I think I was not using enough olive oil, This is so wonderfully comforting to me. Thank you! Wow this looks so good! I must try it some time! TWC! Love the green beans. The simplicity of Greek cuisine cannot be over-appreciated. Shout it from the hills. More importantly, I adore that drawing. What’s going on there? On another note: I gave someone high recommendations to visit Eva’s on Greenlake. Thank you. :) Shame to say….never been to Eva’s! I know, I know… the drawing is a little bit from my son’s drawing journal. He draws so many great character’s and I like to show one every so often. I read recently that fresh dill lends a freshness to certain foods. I’m wondering if that’s true here as well. I’ve just bought a ‘living’ pot of it but it’s wilted badly. If it’s still usable I’d love to try this. Too bad the fresh dill “wilted”. I imagine it is till usable. Dill certainly adds a great flavor and yes, perhaps it is a sort of freshness. I’m very keen on the combination of dill and feta. The weather these days has me thinking about one of your lentil dishes! I kept turning out the same results with this dish. It was only “ok” until I finally nailed it. Maybe it is the dill, I am not sure. The feta was quite good too. I feel like it was once I added more olive oil and allowed it to come to room temperature it was dialed in. ??? Childhood flashback… I used to steal the green beans and eat them raw and then eat the feta and none of the cooked beans. I might try this dish again now that I’m older and am not being forced to eat it weekly… Such a cute photo! That’s great! Weekly? You lucky. Maybe you would have a newfound appreciation for it. I’m am so enamored by it. Truly love it. As a child my Mom always made green beans in tomato sauce and to this day it’s one of my favorite meals. I love that you had with feta, this is so delicious. This brings back great memories. And the fresh herbs really gave it something to write home about. It is one of my favorite meals too. We actually have this as a one pot dish. It has taken me so many years to perfect this and I kept dreaming about it, wouldn’t give up. Finally feel like it is worthy to share. I love that your mom made this too. I think this is a very traditional Mediterranean dish. Yes it is, I am going to be making a Persian version (that rhymes, LOL) it can be made with or without meat and is layered in basmati rice. I just love tomatoes and green beans!! Wow. Your “Persian version” :) sounds lovely. Especially with basmati rice. Love to hear about it. What a wonderful post! Love the dish, the writing, the cookbook, the list of dishes that made my mouth water, and your photograph is beautiful! This sounds wonderful! I have never had green beans this way. So hearty and delicious. Yum! Thank you re. the drawing! I hope you get a chance to cook up a pot of these green beans. I could eat them every week! Lovely vibrant colours x looks delicious! My dad made green beans like this, minus the feta and dill. Looks great! Thank you Lidia :) I always love to hear about “dad” dishes. Very special to me. I make a green bean and tomato dish during summer when tomatoes are plentiful. I can’t wait to try your Greek version…it sounds wonderful. Thanks Karen. Hope you get a chance to try it before the season runs it’s course. It really is wonderful! Mom combined tomatoes and green beans but feta wasn’t part of the equation. I bet it brings a lot to your dish. Thanks for sharing. I imagine feta is the Greek version of this Mediterranean dish. I would be interested to hearing your mom’s recipe for sure! yum! I remember seeing a similar recipe in a newspaper article a year or so ago. It noted how cooking waaaaaaay past tender-crisp really works in this dish and I totally agree. Love the colors in your photo and how perfect the feta would be on top. That’s it! Exactly. Cooking them way past tender-crisp is the key here! So succulent and yet still holding on to a firmness that is just right in a stew. Thank you for you lovely comment Liz. First, you have written your memoir beautifully! Second, you made me wanting to rush to my Greek cookbooks and reminisce the fantastic food I had in Greece. I can imagine how delicious a stew these green beans made with ripe tomatoes, basil, dill and feta on top. Yum! I truly can not wait to try this! I usually do my green beans tender crisp with olive oil and salt as well but this sounds so wonderful. Can’t wait!! 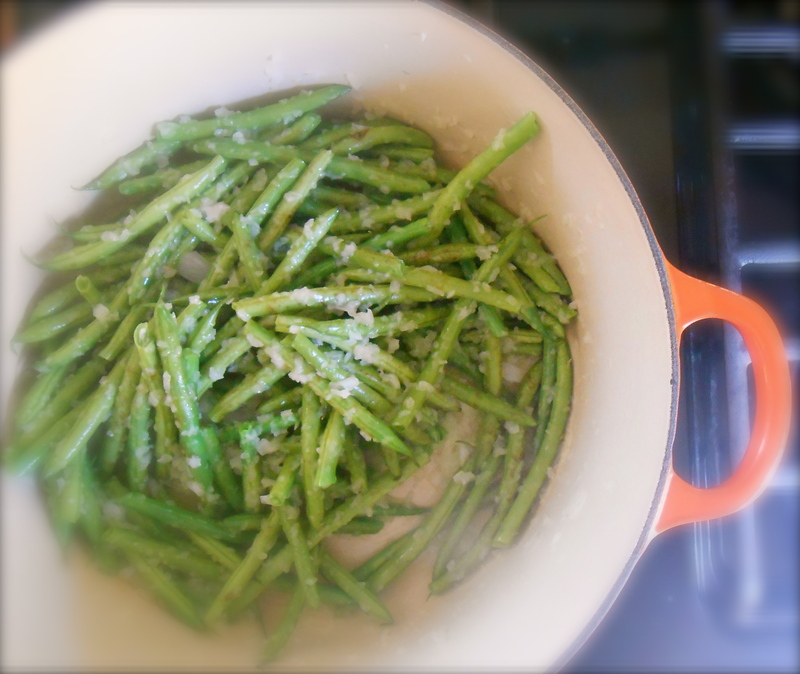 It is such a flavorful way to cook green beans. And there is something about the tender texture that makes them even better. I hope you get a chance to make them. This is a dish I never had the pleasure of trying in Greece! Might have to recreate it in my kitchen, now that you’ve said it’s one of your favourites. Yes! It is very delicious on the top, along with the dill and basil. As an English mum raising children in Greece, my mum learned to make these very early on! We always had them with potatoes and carrots added into the stew (more filling for growing kids). Can I also recommend a dollop of Greek yogurt on top – it makes the sauce wonderfully creamy (especially if warmish). Ohhhh. This post has transported me straight back to Greece. We were there many years ago and I remember eating a big bowl of this beautiful stew with calamari, and bouzouki music in the background. *sigh* I’ve never made it myself, but have bookmarked your recipe and will definitely give it a try! So you know exactly what I mean! Every time I cook Greek food I have that same music playing in my head. Don’t you just love Greek food. I seem to long for this dish and the gigantes beans (to only name two) ! Hi Laura! Thank you for your nice comment. :) I’m a bit lazy when it comes to vegetables that are wonderful “just steamed”. This is one of those recipes that bring out a sigh when you eat them. Bacon and pine nuts sound good! 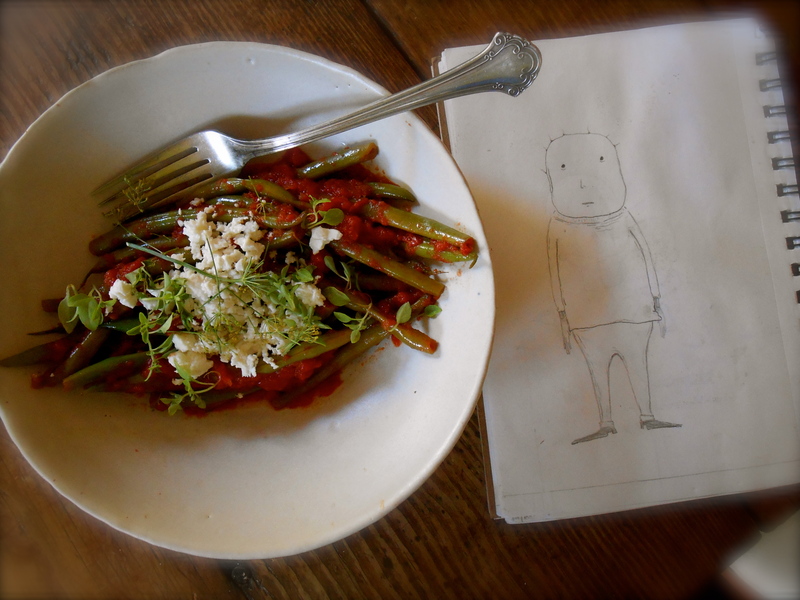 You are currently reading greek green bean stew (fasolákia fréska) at COTTAGE GROVE HOUSE.